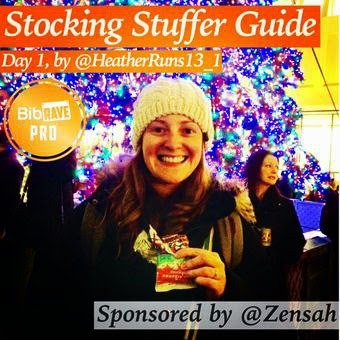 If you follow BibRave on Twitter, Facebook, and Instagram, which I hope you all do by now, this past week they did a Stocking Stuffer Guide with some of the BibRave Pros' favorite things (sponsored by Zensah). I just wanted to do a brief recap of what each day was for y'all, and just a heads up, I'm a fan of EVERY item on the list. I love me some Clif Bars and Shot Bloks. I pretty much keep a few bars in my purse/bag at all times for when a snack is needed (which for me, is often). I especially like the minis – they are the perfect size and about 100 calories each. Here's my review on some Clif Bar & Company products. 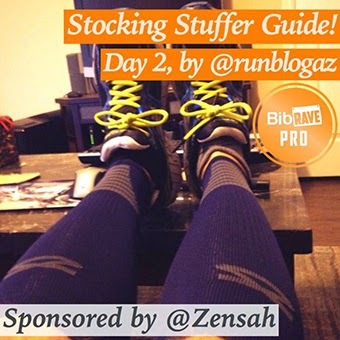 Day 2: Jeremy's favorite recovery tool = Zensah! 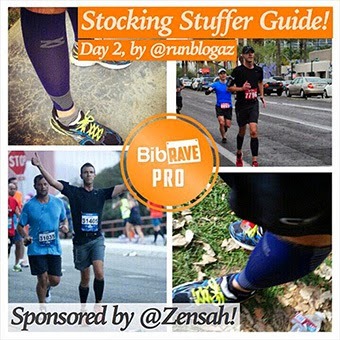 I have taken to wearing my Zensah sleeves on my long training runs during this Dopey Challenge training session. They help keep my legs feeling strong even when they are tired. I've found the Ultras to be an amazing tool for after the runs – they have a bit more compression, which helps with the blood flow and muscle recovery. You can read my review here and Jeremy's here. 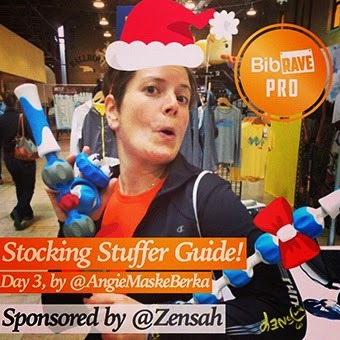 Day 3: Angie loves to recover with Addaday! She takes such fun photos! Addaday has some of the most AMAZING rollers to help heal tired muscles all over the body. I have the Ultra Roller Plus Series Pro which offers a variety of gears and even has a precision gear to get some of the harder to get at places. Read my review here and Angie's here. 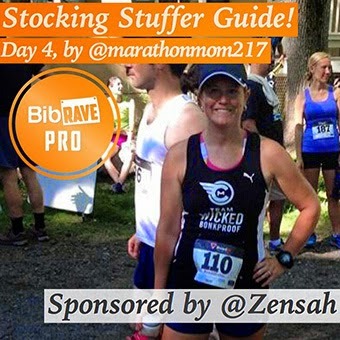 Day 4: Amy loves her Garmin! I don't have a review for a Garmin, but I've been using the Forerunner 220 since May and love love love it. I've only had trouble with the accuracy two times since I started using it, which I think is pretty great. 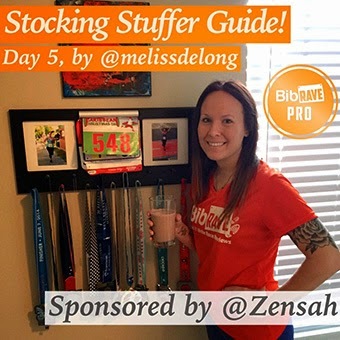 Day 5: Melissa loves to recover with Chocolate Milk! Since I heard of the great powers of Chocolate Milk after running, I decided to try it out for myself. 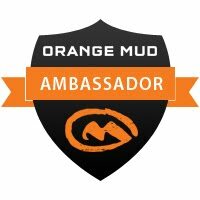 I've noticed some quicker recovery in my own muscles after longer/tougher runs—it's been a quicker recovery time, and have noticed the day after those runs, I don't feel as bad as I used to. There were days that I would have trouble walking the next day from sore legs, but that soreness has greatly been decreased since adding chocolate milk to the recovery lineup. 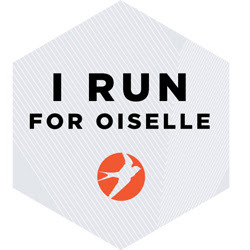 I drink it as quickly after my run as possible (I believe they say within 20–30 minutes is best). I've also been keen on the extra protein kind – that extra 20% is a wonderful thing. Again, no review for this one, but if you like chocolate milk, I would try adding it to your routine. Would love to hear how you notice a difference. So that's that, my dear friends. All of these things make some great stocking stuffers (though maybe don't add that milk until the last minute ;) ). I would be a happy camper to find any one of these products in my own. 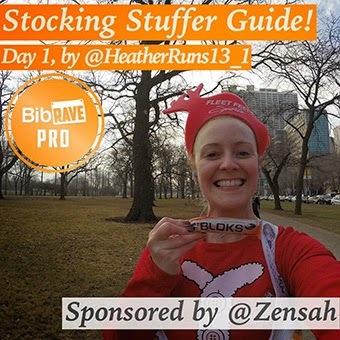 Thanks - I would too :) Hope you find some great runner gifts in your pile on Christmas morning!